Joy Creek Photo Archive (c) all rights reserved This versatile Star Jasmine was introduced by Ernest Wilson from one of his plant expeditions to China. Because it is self-clinging, it can be used to cover walls and trellises. It can also be used as a ground cover. We planted it in a concrete cut-out where it forms a dense, weed-resistant ground cover that looks attractive year round. Its shiny leaves are deeply veined and often stained purple. 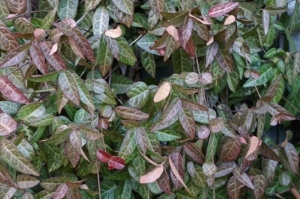 The leaves are especially vivid in the winter when they turn red purple. Trachelospermum jasminoides 'Wilsonii' is a vigorous vine, so don't be afraid to keep it in bounds. For instance, we prune our cut-out at the end of winter but also when we want it to look spruced up in the summer. Oddly, after many years, we have never had Trachelospermum jasminoides bloom. June, July, August. 16 ft. x 8 ft.